In my last post, I misq uoted one of our contractors regarding cost to build a very basic adobe (depending on location). Rather than $160 per sq. ft., the corrected figure is $120 per sq. ft. An additional quote to build a more custom adobe near Ruidoso, NM came in at around $135 per sq. 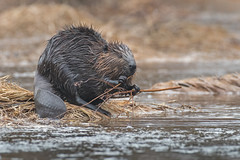 ft. from another licensed contractor, but could end up being more due to a few extra features the client is likely to add. So if you’re planning to build and trying to keep sq. footage costs down to a basic level, what are some things to avoid? An easy one is to keep floor levels the same height throughout the house. Every step up or down means more foundation work, leveling and rechecking. Another is to reduce the number of corners and turns in the home. Every time you turn a corner, masons must slow down, check their leads and reset their lines. Another easy one is to ask yourself is if adjacent living spaces need to be separated by a door. If not, an arch will do, look good and raise the attractiveness of the home. 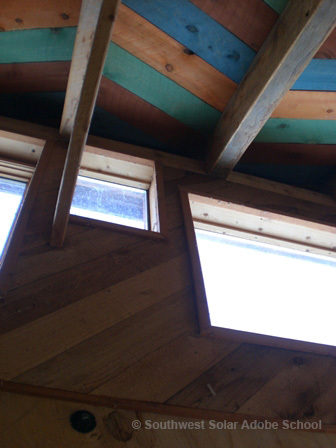 Plus, passive solar heating and cooling are aided by open floor plans. Still another is to run the tops of most window and door roughbucks up to the underside of the bond beam that by code must be installed on every earthen home. 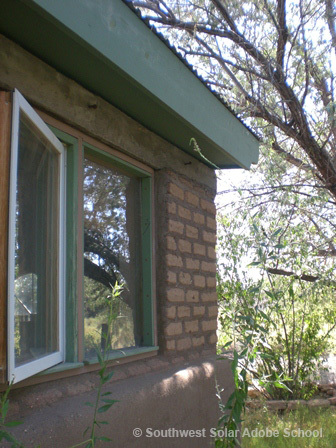 Using standard window heights, the builder can save the cost of lintels by using the bond beam as the lintel above most doors and other openings. One saver that most don’t realize is that an exposed, fully stabilized adobe or pressed block wall is cheaper to build than an unstabilized or semi-stabilized wall of the same materials that is covered with plaster or stucco. Plastering is not cheap. Plan your smooth plasters to go where they are traditional, such as around kitchens and bathrooms or areas that will be cleaned or tiled. Darker adobe walls can be painted with slurry of light colored dry wall compounds or mud slips to lighten up a room (don’t use vinyl-based paints). Keep in mind that electrical in exposed adobe walls must be run within the coursing- no gouging or channeling is advised, as aesthetics are important with exposed work. My next post will continue on the theme of Expanding the Starter Home. Stay tuned. A recent meeting of The Earthbuilders’ Guild revealed a topic of some controversy. I broached the following query to four licensed members, all in New Mexico. 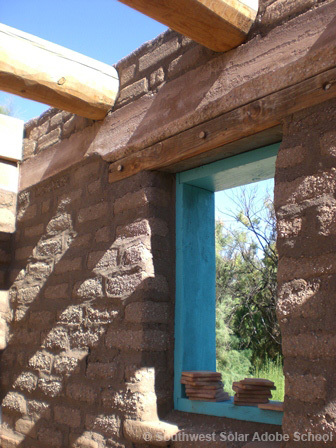 Two are adobe homebuilders, one builds both adobe and compressed earth block homes and one builds with rammed earth. The question: their cost per square foot to build a turn-key home; not a fancy, super custom one, just an ordinary house without a lot of bells and whistles. This is a sensitive discussion area for most contractors and some will not discuss “ball park figures”, afraid that they will be categorized into a price range they feel is inaccurate. “Every project is so different”, they are apt to say. One of the adobe contractors felt that he could indeed break the $100 per square foot ceiling and come in somewhere in the 90’s. He is a man of many years experience, and will tell you how quickly his good crew can lay up adobe walls. He has apprenticed under some of the Albuquerque North Valley builders of renown, such as Nat Kaplan. One rammed earth contractor also builds with frame. He too is an experienced tradesman of many years, coming up “through the ranks” before finding his favorite medium in rammed earth. He felt that somewhere around $135 per sq. foot would be his minimum figure to build a basic home for you, that is, without the frills. The contractor who builds with both compressed earth block and adobe has a solid background in frame and has branched out to adobe and CEB in recent years. He builds over a larger, statewide territory and must coordinate a lot of supply and labor in his jobs. He felt that to make a dime, he would be looking in the $160 per sq. ft. range, as a minimum. The fourth member has found a kind of niche for her rammed earth projects. She does not quote or stress per square foot costs, but looks at the total figure the client has available to build “what they think they want” in the home. She then customizes the project within that figure both in terms of square footage and any special features. Her team has designed some very low cost rammed earth homes (one for Habitat for Humanity) as well as the fanciest possible, all in the Las Cruces, NM area. My next few blogs will list the factors that drive per sq. foot costs up or down for these unique homes- whether you live in Santa Barbara, Scottsdale or Santa Fe. Use them as tools to help in your design process.